I hit the road at 5am and made it to the DB on Lake O. at 6am. I set out to hit the T. run and there was a line there in the dark ahead of me but I found a half way decent spot. 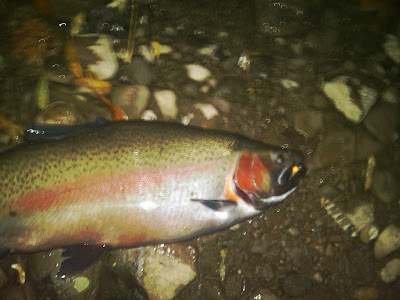 I popped a male steelhead on an orange bead on the 2nd drift and it was down hill from there. In my opinion it was slow today once the sun came up and there were not sufficient amount of fish around for me to hang around. I was back in my truck and on the road at 8 am and beat a path closer home to the other 18. We had south east winds today and my gut was telling me it wasn't going to be a hot day. I fished a section of the trib for a few hours with no takers and packed in by 11am.